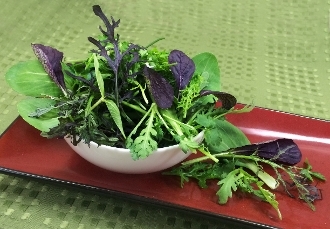 Remarkable combination of Petite Asian greens, including shisos, mustards, mizuna, shungiku, mung, pak choy, & tatsoi. Colors of green & purple. Wide variety of textures. Lightly dress and use as a tasty salad. Top Asian style ribs & steak. Add to teriaki chicken & noodles or stir fry dishes.